Polish rabbi; born at Cracow; died at Lublin Nov. 25, 1668. 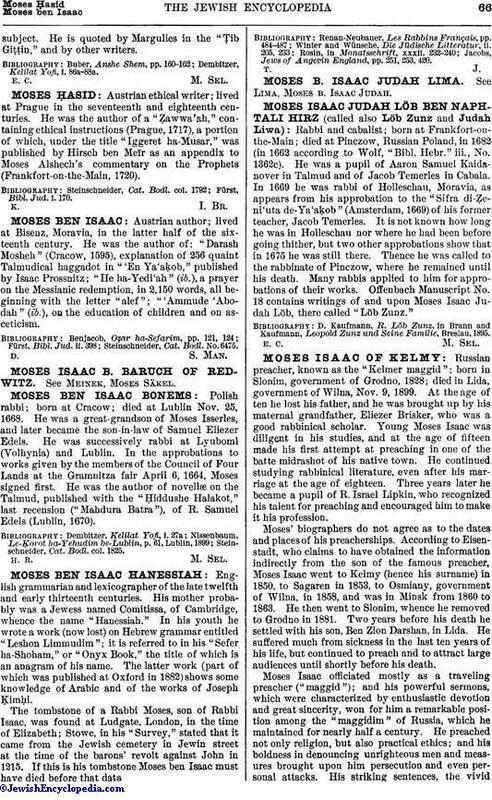 He was a great-grandson of Moses Isserles, and later became the son-in-law of Samuel Eliezer Edels. He was successively rabbi at Lyuboml (Volhynia) and Lublin. In the approbations to works given by the members of the Council of Four Lands at the Gramnitza fair April 6, 1664, Moses signed first. He was the author of novellæ on the Talmud, published with the "Ḥiddushe Halakot," last recension ("Mahdura Batra"), of R. Samuel Edels (Lublin, 1670). Steinschneider, Cat. Bodl. col. 1825.